Take a quick tour. Our charter boat is fully equipped for a great day of deep sea fishing. This walk through in Cape Canaveral tours the deep sea fishing boat interior and exterior. We are located in Cape Canaveral, near the world famous Cocoa Beach Pier, Kennedy Space Center Visitor Complex, Ron Jon’s Surf Shop and other great attractions. Additionally, less than an hour away from the Orlando Florida attractions including Disney World, Universal Studios and the water parks. Whether it’s family fishing adventure or just a first time deep sea fishing trip, we can accommodate you. We have weekend guest join us who have never been fishing and anglers with years of experience come aboard. We want to take you on the best Port Canaveral deep sea fishing charter possible. The Ocean Obsession II fishing boat is available every day of the year as long as the ocean conditions are favorable. We offer full days, half days year round & specialty night shark fishing trips in the summer months. All of our deep sea fishing trips are fun for the family! 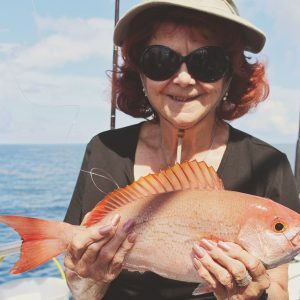 Please submit your videos of Sharks, Snapper, Mahi-Mahi, Kingfish, Grouper, Cobia, Sea Bass, Flounder, Mangrove Snapper, Amberjack, Tigger fish, Sail fish and any other deep sea fish you catch!